Kingston just announced they are releasing a 256GB capacity SD card, which is enormous, but not too big for the Vinpower SD Duplicator. SD cards are the standard for video camera, cell phones, tablets, etc., so itâ€™s only reasonable that SD card manufacturers will create larger and larger capacity cards. So why would you want to limit your production with a SD duplicator that canâ€™t accurately duplicate these large scale flash media, like the 256GB SD card? 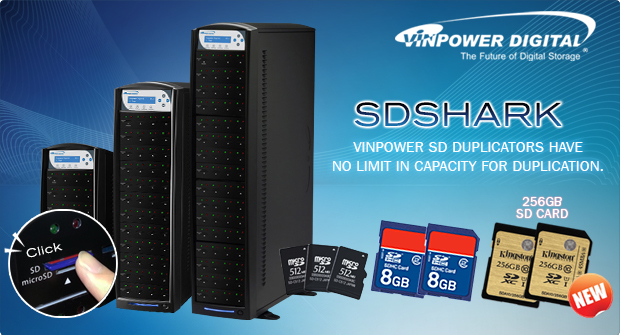 Vinpower makes sure that our flash duplicators, including the SD/Micro SD range of duplicators can match any capacity on the market, for a reliable and accurate duplication. So if you need to make copies of SD cards, either standard size or Micro SD versions, Vinpowerâ€™s line of SD/Micro SD duplicators are always ready and capable. Contact a Vinpower representative to learn more about our full range of Flash, Optical Disc, and Hard Drive duplicators, components, accessories, and more. Taiwan has become the global leader in manufacturing recordable optical discs, like CD’s, DVD’s, and Blu-ray. That doesn’t mean that every disc manufacturer in Taiwan is the best, but many of the best discs sold around the world are made in Taiwan. Seeing “Made in Taiwan”, gives customers a sense of confidence that it’s more likely to be better quality media. Because of this reputation, there are companies that want to trick their customers that their media comes from Taiwan or is of the same quality, by labeling it as, “Taiwan Solution”. So they will sell it as a Taiwanese media, but in reality it could be from anywhere. Typically this is done so that the seller can mix between low grade media and a higher grade media from Taiwan to make the customers think that all of the media is actually â€œMade in Taiwanâ€ and it should have a better quality. Ultimately, the customer ends up with media that is hit or miss, where some batches are OK and others are very low quality, often manufactured by companies outside Taiwan with lower standards. But when they use the “Taiwan Solution”, thereâ€™s no way to tell which media is from the good or bad manufacturers, because you donâ€™t know where it’s from. Don’t get tricked by marketing tactics, be aware when media says â€œTaiwan Solutionâ€ that it doesnâ€™t mean its “Made in Taiwan”. 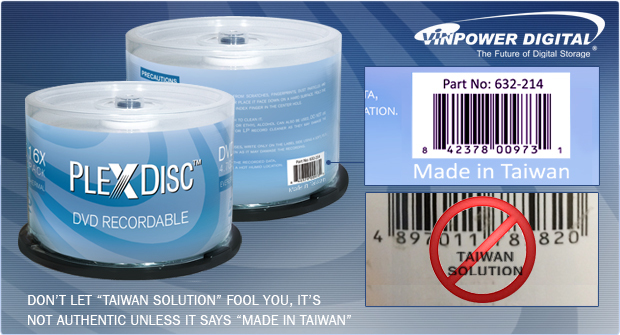 Contact Vinpower Digital to ensure you get true “Made in Taiwan” media at the best pricing. The data on archival discs isnâ€™t the only thing that should last for hundreds of years, the printed label on the discs needs to have an archival quality too! Archival discs are meant to store content for 50, 100, or 1000 years into the future, so why would you use a sharpie or water based inkjet printers on standard inkjet printable media to label those discs? Shouldnâ€™t the label on the disc look nice and hold up to the wear and tear of time just like the data on the disc? How else will anyone know whatâ€™s on the disc if the label is no longer recognizable? If youâ€™re going to spend the money to ensure you have long lasting quality archival media, then you should get the TOTAL SOLUTION! Vinpower now offers a line of both DVD and Blu-ray recordable archival media with the glossy, water, and scratch resistant Liquid Defense Plus inkjet printable surface on top. The Liquid Defense Plus inkjet printable surface allows you to use virtually any inkjet disc printer to label the disc(s). The Liquid Defense Plus Archival Media provides a stunning printed image along with the peace of mind that the data and label will hold up over time, regardless of coming into contact with moisture or other harmful common conditions. 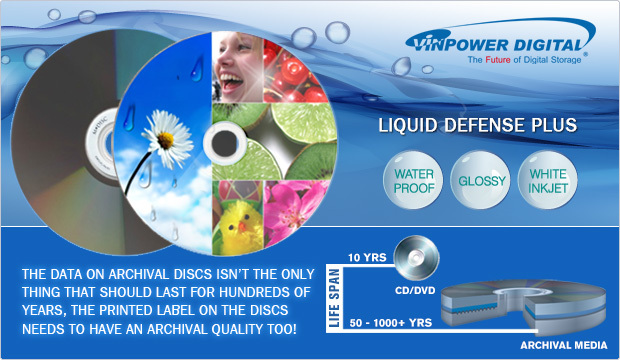 For more details about the new archival DVD and Blu-ray recordable media with Liquid Defense Plus, contact a Vinpower representative today. 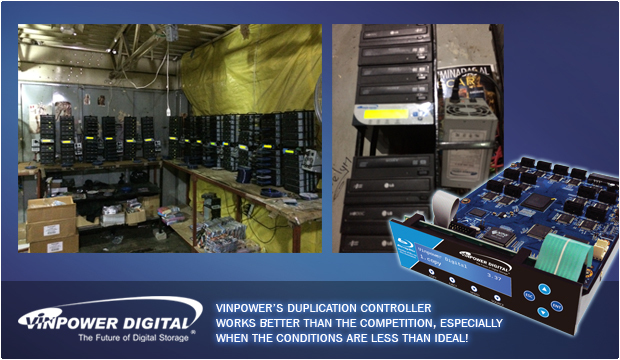 Vinpowerâ€™s duplication controller works better than the competition, especially when the conditions are less than ideal! In a perfect duplication world, the duplicator case will be made of aluminum and contain multiple fans to cool off the drives, which create substantial heat due to constant usage. Plus, all the drives will have proper spacing, be uniform (meaning using the same model numbers and firmware across all of the drives in the hardware), and have adequate electricity to power all of the drives. In that scenario, most any controller will give you a reasonable success rate. But what happens when you have situations where the conditions are not ideal for duplication? What if thereâ€™s minimal air circulation to cool off the drives, or the system is configures numerous different brands and/or firmware of drives, or the user is copying disc continuously for 12, 16, even 24 hours a day? Thatâ€™s when duplicatorâ€™s controller makes the difference between successfully burned media and failed discs that become coasters. Thatâ€™s what separates A grade equipment like Vinpower and inferior equipment from lesser quality competitors. Vinpowerâ€™s controller has been tested to provide the best results even when working in less than ideal situations. Itâ€™s been proven to work mixed drives brands/firmware, when the heat is not properly ventilated, when media is mixed from different brands, or even when the drives are older and has some errors with certain medias. Vinpowerâ€™s controller has proven to overcome far more issues than any of its competitors. Of course, Vinpower recommends maintaining and operating your duplicator under optimal conditions for the best results, however, we know that is not always an option for everyone. Vinpower developed its controller to a higher grade, so that it can function better and ensure more reliability than any other standalone duplication controller on the market. If you want the best and still pay less in costs and maintenance, then Vinpowerâ€™s standalone duplication controllers and hardware are the only options. Contact a Vinpower representative today.